this beautiful illustration from 1918 is the frontpiece for the first book Dorothy Pulis Lathrop ever illustrated. she would go on to become the first winner of the caldecott prize for illustrations for a children's books. of wine-cups and compliments and kisses of the two-sword men. i would call this 'japonaiserie' rather than 'japonisme' because the latter is western work, generally, done with japanese design and execution standards. 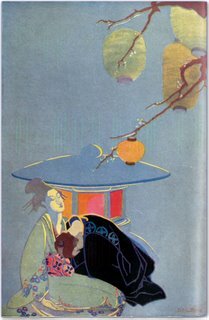 japonaiserie, rather, is more like chinoiserie: western work which mimics the work from one of these two asian countries. i don't mean to imply that there is a hard, fast rule, a line that everything falls on one side of or the other. also, both movements occurred in the same era, the end of the 19th century (a time when the west was being flooded by goods from japan for the first time in 250 years), and the beginning of the 20th. so i would suggest that this image is quite a western one of an exquisite asian theme.